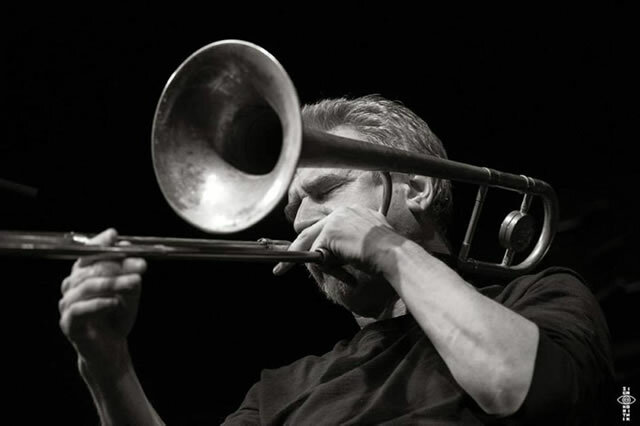 Steve Swell has been an active member of the New York scene since 1975. He has toured and recorded with a wide array of musicians, ranging from legendary jazz traditionalists like Lionel Hampton and Buddy Rich to renowned avant-gardists such as Anthony Braxton, Bill Dixon, William Parker, and Cecil Taylor. His discography consists of over 50 albums as a leader or co-leader, with appearances as a sideman exceeding more than twice that number. After studying in the mid-1970s with trombonist Roswell Rudd (as well as Grachan Moncur III and Jimmy Knepper), Swell joined Makanda Ken McIntyre’s band which resulted in subsequent tours and recordings with myriad creative music luminaries including Joey Baron, Jemeel Moondoc, and Ken Vandermark, among many others. As a bandleader Swell has led a number of projects, including Slammin’ the Infinite (w/Sabir Mateen, Matthew Heyner, Klaus Kugel), Fire Into Music (with William Parker, Jemeel Moondoc, Hamid Drake), Unified Theory of Sound (with Cooper-Moore, Matt Lavelle) and his large ensemble Nation of We (aka NOW Ensemble). Swell has received numerous awards, commissions, and grants over the years: a USArtists International (NEA) travel grant in 2006; grants from MCAF (LMCC) in 2008 and 2013; and three commissions for the Interpretations Series at Merkin Hall in 2006 and at Roulette in 2012 and 2017. He received the Jubilation Foundation Fellowship Award of the Tides Foundation in 2008 for his work in the New York City public school system. As an award-winning trombonist, Swell has been included in the Downbeat Critics Poll in the trombone category every year since 2010. He was chosen as Trombonist of the Year 2008-2010, 2012 and 2014-2017 by the Argentinian magazine El Intruso and was nominated for Trombonist of the Year in 2008 & 2011 by the Jazz Journalists Association. In addition to running workshops around the world, he also teaches in several capacities: as a teaching artist through the American Composers Orchestra, Healing Arts Initiative, Mind-Builders Creative Arts Center (Bronx), the Jazz Foundation of America, Leman Manhattan Preparatory School, and the Brooklyn Conservatory of Music. With new projects and recordings materializing on a regular basis, I interviewed Swell in the summer of 2018. Troy Collins: Although you’ve been omnipresent in the scene for decades, some formative biographical information might be of interest to readers unfamiliar with your early background. How did you get your start playing music? Steve Swell: I was born in Newark, NJ but largely grew up in nearby Union, NJ. My father was an auto mechanic who, before he became an auto mechanic was a musician. He played alto saxophone and clarinet. He was pretty intent on trying to make a living as a musician but gave it up when he started our family. When I was nine years old he gave me clarinet lessons for about a year. I really struggled with it and didn’t get very far but it did lay some groundwork for me in terms of being able to read music a little bit, plus my father was very into big bands and New Orleans jazz and he played a lot of those records for me. A really influential early teacher of mine, Al Schmidt, gave me a wonderful gift around this time and it was the gift of learning about how to improvise. Being ten or eleven years old, he knew that rather than inundating our small elementary school band minds with all kinds of technical information the best introduction to the art of improvising was to just do it. Without any complicated instructions he played the theme from the Batman TV show and said when he got to the break each time we would all take turns playing something on our instruments. Anything. When it got to be my turn the first time with this exercise, the natural thing for a trombone player to do was to gliss up from a low note up to first position. That was my first experience with improvisation. I remember this experience very clearly and the big thing that that experience gave me was that improvisation is a very natural, normal way to express oneself. I moved to NYC in 1975 and jumped right into all the music that was available to me at that time. I played everything from salsa, R&B, rock, big bands, klezmer. There was also a couple of years in the early ‘80s that I toured with Lionel Hampton and then Buddy Rich. All of it gave me a firm foundation as far as being able to read almost anything in any kind of handwriting and the different approaches to improvisation that those scenarios offered. I also subbed Broadway shows and did some national tours of those shows for about five years. That really got me out of the NYC metro area and helped with my road chops enormously. Since I had been listening to all kinds of jazz from about ten years old, when I moved to NY I heard about free classes being given through Jazz Interactions which had Roswell Rudd as a teacher. I of course jumped on that since it was Roswell that really woke me up to playing the music I’m playing now. We maintained a really beautiful relationship from then until his passing last year. After I had my fill of “jobbing” around NY I started to play with Makanda Ken McIntyre in the early 1980s. He was a teacher and band leader that also had a huge impact on me. He convinced me to give up all the non-creative work I was doing and concentrate on creative music, which I did. From there I worked my way through all the bands during that time, the Knitting Factory scene with Tim Berne, Joey Baron. I also started to play with William Parker and Jemeel Moondoc and many other musicians in NY during that time. It was great to get all that experience and while I wasn’t making a living with music as I was when I was doing other music work, by concentrating specifically on improvising and learning to put groups together from some great musicians, all of that didn’t matter. I was where I really wanted to be in terms of what to do with music. TC: I assume at this point, based on how busy you are leading your own projects, and working as a sideman, that you don’t need to have a non-music related day job now? SS: I would say my last non-music day job ended shortly after 9/11. I was a temp proofreader in some of the financial and law firms based in lower Manhattan. After that day a lot of that kind of work dried up for a long time. Prior to being a temp, which I did for about ten years, I was a taxi driver in the ‘70s, a bus boy, a waiter, and I worked in a shoe warehouse, loading and unloading trucks. While I had some good work playing “creative music” starting in the mid/late ‘80s, I still needed to do other work to keep my head above water. At the end of 2001 I started to do a little bit of teaching which got me out of those other kinds of work. While I really wasn’t fond of teaching at first, I came around to love it and understand its importance in terms of giving something valuable to another human being, whether it’s actually teaching music or just being supportive in shaping a person’s life. My first steady teaching work was through guitarist Paul Nash. I worked through him and a grant he received from the state for five years. I taught at three different schools per semester for those five years and it was exclusively with special needs kids in the NYC public school system. Being involved with that population was really eye opening and heart opening for me. While I still teach whenever I can and when its available to me, the last twenty years or so has really been fruitful in terms of the creative work always gaining a certain momentum and affording me with a decent paycheck. While being a freelancer in this music there are always ups and downs. But there always seems to be something on the horizon, whether it’s as a sideman or a project I am asked to present or something I will propose myself that may get some gigs, tours or recordings allowing me to keep that momentum always on the rise. I’m very fortunate to have enough work to be able to pay the rent on time now and great musical friends to play and create with. TC: It’s great to hear that you’re able to make a living playing the music you love. Your schedule however, seems daunting, what with so many gigs, recording sessions, teaching opportunities, etc. I’m curious how you keep track of it? Do you do it all yourself? Do you have a booking agent or PR firm to help? Do you use a smart phone to manage it, or are you more old school? SS: Oh man, we’re getting to the nitty gritty of the business aspect. In real estate the mantra is “location, location, location.” In keeping up with what’s going on musically and maintaining a full productive schedule for myself its “organize, organize, organize.” I keep a pretty organized schedule yet I’m also pretty loose at the same time. I know that seems contradictory, but I’ll explain it this way. I like to parcel out my time in one-hour blocks. I’ll set my iPhone for one hour and do what it is I want to do from a list I make the night before or the beginning of the day. I’m big on writing lists of things that need to get done. If it’s getting back to people on emails or texts I will do that or figuring out tour logistics that I am putting together and contacting venues I will do that. After that one hour I may continue for another hour or half hour. After that block of work, I also keep track of what I’ve done by logging it into an “old school” chart for the day to see what I’ve been up to. I will usually do this right after breakfast but it’s not an exact time of day I do it and I will also do it in other blocks of time during the rest of the day when I feel it. I also need to practice every day so that goes on to my log of what I do each day. The iCalendar of course has become indispensable in terms of keeping track of when, what, and where gigs are and also putting in time frames I need to hold for tours or gigs. The fact it syncs to my iPhone is a huge help when I am not near my laptop and can confirm something with someone when I’m at a gig or session. I do not have a PR person. I do have friends here and there that book certain projects in Europe for me and my other musician friend contacts in Europe may have agents or are booking things themselves that I am a part of. I do all my own US/Canada bookings and some European stuff too. It’s really a conglomerate of all kinds of relationships that I have maintained over the years that keeps me working. TC: Keeping organized definitely sounds like the key for someone as busy as you. Since you have such an imposing schedule and extensive discography, what advantages and challenges have you found in contributing to so many different groups? SS: Well, the simple fact is that I love to play and improvise. I also like exploring a variety of sound worlds with a number of different musicians and either working on projects of my own or other folks’ projects. I really like a variety of things to do. I think the advantage in being able to do all that is that you are always finding something new to play and those moments of discovery are what makes this music so enjoyable to play and listen to. It’s like mining for gold. You may not always find the mother lode but when you do its one of the best feelings in the world, and there is always some bit of gold dust to be found in any situation. I am very lucky in terms of how much time I’ve put in at this point in my life that I get invited by some of the world’s best improvisers who are open to what I do which is always an honor and a thrill. I am still loving and discovering things in this music whenever I get the opportunity. TC: Considering your own varied career, the jazz bands of a previous era typically featured long-term personnel for extended tours, although that has largely changed now, for various reasons, both aesthetic and economic. But you’ve managed to work with a few (Basement Research, Chicago Plan, etc.) for the long haul. What advantages and/or challenges do you find in being a member of a longstanding group? SS: This is my biggest concern being a musician at this time and in New York. It’s very difficult to keep a steady band together. Musicians are scuffling, and I understand the need to do so many things as I do myself in order to get by. But getting any kind of commitment with a real understanding of your own music or how you improvise and to be able to develop it beyond what you get the first time out playing does not happen like it used to. I’ve heard so many stories of bands in the ‘60s and ‘70s living together and getting up in the morning and playing music all day like the Art Ensemble or Circle. And of course, earlier eras too. The Ellington band or Basie band setting up in a club for a month’s long engagement or by touring constantly gets you there as well. To be able to live and work on your band and concepts in that way seems so much like a fantasy now. But it did happen. It could still happen again. What I notice that has happened for me is that if you’ve known musicians for a long time like William Parker, Gebhard Ullmann or Rob Brown and you are not playing all the time with them, you still get a real good sense and connection over the long haul with them, so there is a vocabulary established and you can interact with them as if you’ve been playing nightly. Being an improviser makes those kinds of connections invaluable. This not to say that the one-offs (or two or three-offs) can’t give you the same kind of spontaneity. Those kinds of situations, improvisational or otherwise are often very fruitful in that you are really going into the unknown and that really should erase all your preconceived-ness of what to do in that context. Those types of groupings can be very rewarding, and I love the challenge of what that kind of setting brings to the improvisational table. The advantages of having long-term projects I think are obvious in all the development that happens or can happen. Even though I don’t see or play with my musical friends every day I try to imagine that particular band’s sound as I prepare for a tour or session and then hopefully get enough time before the gig or recording to rehearse. I will do that with my own music or go over someone else’s written material in the practice room to really get inside the pieces. There is also the aspect that if you’ve been working on a band for a while and you understand the compositional aspect, if there is one, by establishing a vocabulary over the long haul with that band or group of musicians frees you up in your improvisations. You are able and willing to take more risks perhaps if you know the compositional aspect has been rehearsed and worked out and you have a good idea where the concept is headed. Of course, with improvisation-only bands when you get to know the musicians in that band over a period of time you can read each other much better and your reactions, musically to what is going on, will have more of a cohesiveness even if you are stepping out way beyond what you might normally do. Having that kind of vocabulary and support from a steady improvising situation will afford you with that kind of base for everyone in the band. Everyone has each other’s back and the telepathic energy is more established and solid. You want to be able to take those risks and feel comfortable about it as that, by taking those risks, is what gets you to new levels and areas of creativity which is what this music, for me anyway, is all about. TC: Since you mentioned “stepping out way beyond what you might normally do” in the context of improvisation-only bands, I’m curious what your thoughts are regarding “pure” free improvisation, compared to more traditional theme and variations-based strategies? And how do you negotiate the differences between the two in different performance settings? SS: I view myself as an improviser first whatever context I am in and I am always stretching what I can find when improvising. Stepping beyond yourself applies to both scenarios for me. Sorry if it sounded like I was separating those. Stepping beyond yourself doesn’t have to be in an improvising-only situation. I think “pure”, whatever that might mean to someone, sounds a bit limiting to me. I know what you are getting at, but I view it as the same energy and I view, whatever context I am in, compositions with improvisation or just improvisation scenarios, you still want to go beyond yourself and take those risks and let something spontaneous happen. TC: Digging a little deeper ... although some find “jazz” too limiting a term, are there any new developments to the jazz tradition you find inspiring and/or any established practices you find creatively constraining? SS: There are so many things wrong with the term “jazz” I don’t even want to get into it here. Wrong from the traditional use of the word and wrong from how modern improvisers view it as well. I have to say though, for lack of a better word we should all be thankful for the music of jazz, early jazz, swing, bebop, fusion, for bringing the improvising sensibility back into Western music which had gone missing for the last 150 years or so. I think there are too many “modern” improvisers who look down on the history and legacy of “jazz” music when they are actually bearing the fruit of what that music brought to the West, particularly in the United States and created the platform for all the modern improvising that we are so familiar with now. Whether they like it or not they are part of that legacy and history and should respect and honor it. For what is going on now in “traditional” forms of jazz I am not really following all that much. I do notice that because of the avant-garde of the ‘60s and ‘70s, I hear a lot of freer language of that music seeping into more traditional players’ improvising. It can’t be helped because it has been out here so long now. There is a kind of sensibility of some improvisers who are maybe working from a traditionally trained jazz school standpoint and then they start laying claim to being something new, many of them seem very restrained in their improvising, almost deliberately which I find frustrating when listening to them. This seems to be getting to be an established approach. It’s not like the “third stream” school or “cool” school of the ‘50s. It’s something else. It’s like they get to a certain point in their improvising and they hit a wall and don’t want to push on that wall even in the slightest way. They just stop. You don’t have to go completely crazy or loud or play high notes, but you can at least put some heart into your improvising. If I find anything that seems to be creatively constraining I avoid it. Period. TC: Moving on from improvising to composing; as a bandleader, do you typically write parts specifically geared towards your band mates’ strengths’ or do you embrace a more egalitarian approach, where the tunes themselves are more open to interpretation by different groups of players? SS: I do both. I do tend to write more specifically towards a musician or group of musicians and their strengths and what I think will sound good and are good jumping off points for a specific musician’s improvising strengths and what I think would make sense for that musician. There is always of course a wide latitude for bringing their own sensibilities. Scenarios like that are especially great if it goes beyond what I am envisioning and it usually does. That’s the beauty of working with improvisation in the context of compositions. If I think also what you’re asking is, do I write something not specifically for a certain group of musicians that could be used by any grouping and open to their interpretation. I don’t do that deliberately, but I think a lot of my writing can be used in that way. It would be interesting for me to try doing more of that kind of composing not geared specifically for certain groupings but open for any group of musicians to play and interpret. TC: In reference to documentation, how do you feel about studio recording compared to live performance and how does that affect your playing in each situation? SS: I like both and of course there are differing advantages and disadvantages. Obviously in the studio you have more control over the sound and getting things to your liking by redoing a composition or trying different things on different takes. Live you don’t have that, but you get what you get which will be more spontaneous. In terms of my own playing and improvising, I will bring the same energy to both situations. In the studio, on my own projects, I tend to do no more than two takes. I approach any recording as if it is a live performance which gives you some of that spontaneous energy. I believe that is how you get a fresher recording as well, especially if time and budgets are a concern which happens a lot in this music. I feel I have gotten to a place where I naturally improvise in any situation with as fresh and as open a mind as is possible for me to what is going on at the time in whatever context I am in. All of the musicians I play or record with share that predisposition. I will approach a rehearsal in that way as well. I’m just naturally geared that way. There is a saying in this music; whenever you play, play as if it’s your last time. TC: Along the same line, what are your thoughts on the state of the recording industry, specifically regarding archival documents (CDs, vinyl) versus more ephemeral formats (downloads, streaming)? SS: I guess I’m showing my age a little bit by preferring hard documents, CDs, LPs to document what I do. Having grown up with LPs only, I always loved going to my local record store and buying LPs, usually only one or two selections, then going home and sitting down and listening, reading the liner notes and looking at the cover art. Just spending time with that LP in my hands while listening to the music. The liners of course always contained information I was interested in. The cover art was really my introduction to art itself. All of that added to the experience for me. I still buy other musicians’ CDs or LPs if it’s is something special I really want in my collection. I do have a Bandcamp site for my solo CD which you can download directly or purchase a hard copy of, but I have not thrown myself “all in” on the download, streaming side of things. I find fans who come out to shows also want something to take away a CD or LP. There’s a lot of collectors out there all over the world who like to have those to take with them. That of course helps with adding to the money I make on a tour and individual gigs as it does with a lot of musicians. There are some bands that rely completely on their merch for making gigs and tours viable. As far as the recording industry itself, this has pretty much gone by the wayside and in terms of this music, it never really existed on a large scale in the first place. There are lots of small labels around the world run by individuals or small groups of people that are great in terms of their commitment to the music and financing. I think there will always be folks who want to record the musicians they like and be a part of what it is you are doing. For this music, there would have to be a huge sea change in the way people think about music and how they value music for an “industry” to develop. TC: Considering the recording industry’s current complexities, do you find musical inspiration in any particular artists, stylistic movements or even technological advances? SS: This is going to sound like a non-answer or a cliché but I find inspiration from all the musicians I work with or listen too. The famous, the infamous, and the not so well-known ones. As an audience member I always hear something I can take away from a performance or CD that will stop me in my tracks and say, “Oh, wait minute, check that out!” Even if it’s a brief bit of something that happens unexpectedly during the course of a set. As long as I’m listening, really listening, those moments invariably happen. When I’m playing, I really get fired up when the communication is happening between the musicians. You start to just bounce off one another and each bounce of a note or sound takes you somewhere else unexpected and your next note or sound might be something you’ve never done, and the group has never done. At that point you begin to create a complete musical entity that never existed before and never will again. Those inspired moments are the ones every musician is looking for. That point is also the point where you are reaching your audience too and you know it, the audience knows it and there’s no other feeling quite like it. I’m not a big “stylistic movements” guy. I don’t fall in love with someone else’s “system” and then try to force myself into that hole. Even if I were to do that it would still come out as me. I am mostly an absorption learner if that is a thing. So, if something seeps into my playing or writing its usually through no conscious effort on my part. It’s not to say that I am unaware that a musician is using a system, it’s just that I don’t go all in on anything that might confine myself to something that does not feel natural to my playing or writing. As far as particular artists I am really listening to at the moment that I take inspiration from, there are many. I still listen to many older styles of jazz and improvising. I am on an email list called “Jazz on the Tube” where they send you a video clip of a musician whose birthday it is that day. I still enjoy those and still find them inspiring. More specifically in what’s happening today I love hearing Wadada Leo Smith, Henry Threadgill and Roscoe Mitchell. There is something about how they pace themselves (timing!) when playing and improvising that I have been paying attention to for a long time now. I find it especially enlightening to see and hear them in live situations. Watching them stop themselves from playing, then coming back in at just the right time with just the right note is something I find very interesting and inspiring. It’s how they do more with less notes and less density at times as another element in their improvising vocabulary that resonates with me. It all flows so beautifully. I think technically the only thing I like or even use is music software. I use Finale and in recent years, while I still sit down at the piano or trombone, I sometimes will compose directly onto the software. With the midi sounds in it you can get a pretty good idea of how something will sound before you get to a rehearsal. TC: Looking ahead, what immediate projects do you have scheduled for the future? SS: I’ve got a number of recordings that will be released in the next several months: Jason Hwang’s new Burning Bridge CD; a new Rob Brown CD (RogueArt); a Whit Dickey CD (ESP) with Matt Shipp and Michael Bisio; and a new William Parker CD. A trio of mine with Michael Vatcher and Robert Boston and I will be in the studio in December with my band Soul Travelers that will add vocalist Leena Conquest for a couple of tracks, singing pieces from a couple of my texts with music that was commissioned and performed but never recorded, for the RogueArt label. I’ll be at the Guelph Festival in September with Soul Travelers, then I will be in Poland for a celebration of the NotTwo label’s 20th anniversary with Ken Vandermark, Peter Brotzmann, and bunch of other great musicians. I will be in Philadelphia for the October Revolution festival with Bobby Zankel, performing and then recording a Muhal Richard Abram’s commission for Bobby’s band that we performed a couple of years ago that Muhal directed. I will be at Tufts University with William Parker also in October. I will be in Oslo in January with Per Ake Holmlander, Germany in February and April with Jan Klare. My co-led band The Chicago Plan with Gebhard Ullmann, Fred Lonberg-Holm and Michael Zerang will tour the US at the end of April beginning of May and do another recording and then we will do a European tour in November/December of next year.